Розглянуто основні прояви злочинності в Українській СРР у середині 1930-х років. Увагу зосереджено на висвітленні головних аспектів діяльності міліції щодо протидії злочинності та ролі окремих її підрозділів у цьому процесі, проаналізовано певні досягнення та недоліки цього напряму роботи правоохоронних органів. У висновках також відзначено, що в цей період відбувалося помітне політизування злочинності, що було проявом посилення тоталітарного режиму в республіці. Timchenko A.P., 1998. Legal frameworks of organization of activity of militia of Ukraine in 1917-1941 [Pravovye osnovy organizatsii deyatelnosti militsii Ukrainy v 1917-1941 gg.]. Luhansk: RIO LIVD. Smirnov Yu.O., Mykhailenko P.P., Sviatotskyi O.D. and Anufriev M.I., 2002. Militia of Ukraine: historical essay, portraits, events [Militsiia Ukrainy: istorychnyi narys, portrety, podii]. Kyiv: In Jure. (Ed. : Smirnov Yu.O.). Zolotarov V., 2018. Chief composition of NKVD of the USRR in the middle of 1930th [Nachalnytskyi sklad NKVS USRR u seredyni 1930 rr.]. [online] Ukrainian union [Ukrainska spilka]. Available at http://www.national.org.ua/library/nkvd_sklad.html [Accessed 15 August 2018]. About formation of all-union people’s commissariats of internal affairs: decision of Central Executive Committee of Union of SSR of July 10, 1934 [Ob obrazovanii obshchesoyuznykh narodnykh komissariatov vnutrennikh del]. Collection of laws and orders of Working-peasant government of Union of Soviet Socialistic Republics [Sobranie zakonov i rasporyazhenii Raboche-krest`yanskogo pravitelstva Soyuza Sovetskikh Sotsialisticheskikh Respublik], 1934, No. 36, Art. 283. About formation of people’s commissariat of internal affairs of USRR: decision of Central Executive Committee USRR of July 11, 1934 [Ob obrazovanii narodnoho komissariata vnutrennikh del USSR]. In: Mykhailenko P.P. and Kondratev Ya.Yu., 1997. 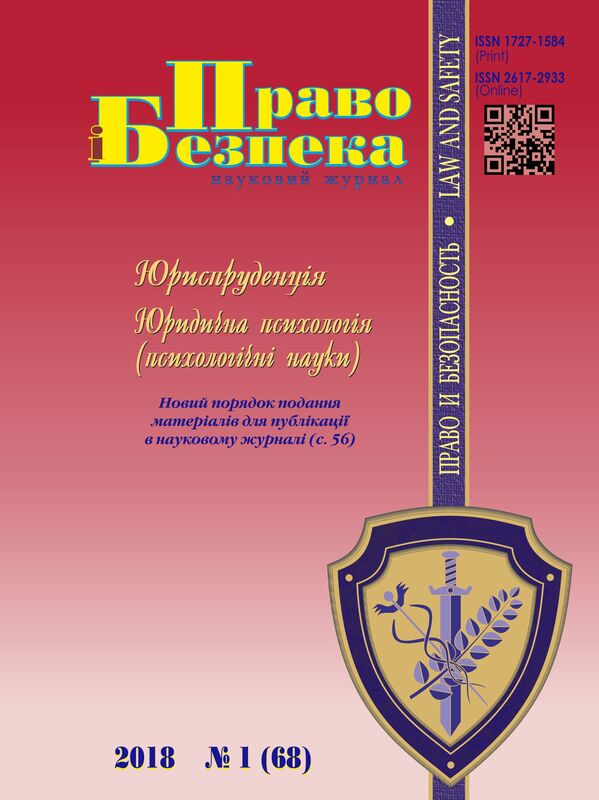 History of militia of Ukraine in documents and materials [Istoriia militsii Ukrainy u dokumentakh i materialakh]: in 3 vols. Vol. 2: 1917-1945. Kyiv: Heneza. P. 205. Memorandum about cleaning from the criminal element of seaports on January 21, 1935 [Dopovidna zapyska pro ochystku vid kriminalnogo elementa portovykh mist]. In: Mykhailenko P.P. and Kondratev Ya.Yu., 1997. History of militia of Ukraine in documents and materials. Vol. 2. Kyiv: Heneza. P. 256. Krasnov D.A., 2013. Basic stages of fight against criminality of minors in the USSR in 1917-1960: historical and legal aspect [Osnovnie etapy bo`by s prestupnost`yu nesovershennoletnikh v SSSR v 1917-1960 gg. : istoriko-pravovoi aspect]. Scientific Works of the Russian Academy of Advocacy and Notary [Učenye trudy Rossijskoj akademii advokatury], No. 1 (28), pp. 91-100. About the measures of fight against criminality among minors: decision of CPK of the USSR, CEC of the USSR from April 7, 1935 No. 3/598 [O merakh bor`by s prestupnost`yu sredi nesovershennoletnikh]. News of CEC of Union of SSR and ACEC [Izvestiya TsIK Soyuza SSR i VTsIK], 1935, 8 April. Averbakh I., 1935. Law of April, 7 and criminality of minors [Zakon 7 aprelya i prestupnost` nesovershennoletnikh]. For socialistic legality [Za sotsialisticheskuyu zakonnost`], No. 8, pp. 10-15. Bandurka O.M. and Grechenko V.A., 2017. Some aspects of economic criminality in USRR in the first half of 1930th [Deiaki aspekty ekonomichnoi zlochynnosti v USRR u pershii polovyni 1930-kh rokiv]. Forum prava – Forum of Law, [online] No. 5, pp. 22-30. Available at http://nbuv.gov.ua/UJRN/FP_index.htm_2017_5_4 [Accessed 15 August 2018]. Mikhailyuk N.Т., 1983. Born by revolution: essay of history of militia of Kharkiv Region (1917-1982) [Rozhdennaya revolyutsiei: ocherk istorii militsii Kharkovshchiny (1917-1982)]. Manuscript. About encouragement of workers of militia: order of people’s commissariat of internal affairs of USRR of November 3, 1935 [О pooshchrenii rabotnikov militsii]. In: Mykhailenko P.P. and Kondratev Ya.Yu., 1997. History of militia of Ukraine in documents and materials. Vol. 2. Kyiv: Heneza. P. 259. A fight for a revolutionary line-up [Bootba za revoliutsinyi lad], 1935. Great October [Velykyi Zhovten], 1 May. About the revision of inspector areas of RS of militia and fixing of district inspectors: order of people’s commissariat of internal affairs of USRR on May 15, 1935 [Pro peregliad inspektorskykh dilnyts RS militsii i zakriplennia dilnychnykh inspektoriv]. In: Mykhailenko P.P. and Kondratev Ya.Yu., 1997. History of militia of Ukraine in documents and materials. Vol. 2. Kyiv: Heneza. Pp. 143-144. Technical minimum for authorized agent of criminal search [Tekhminimum dlya upolnomochennoho ugolovnoho rozyska]. In: Verbenskyi M.G., Yarmysh O.N., Protsenko T.O. et al., 2015. Ministry of internal affairs of Ukraine: events, leaders, documents and materials (1917-2017). Vol. 4. Kyiv. P. 358. Speech of people’s commissar of internal affairs of Union of SSR of Yagoda on meeting of chiefs of regional and regional managements of militia on April 16, 1935 [Promova narodnoho komisara vnutrishnikh sprav Soiuzu RSR tov. Yagody na zasidanni nachalnykiv oblasnykh i kraiovykh upravlin RS militsii]. In: Verbenskyi M.G., Yarmysh O.N., Protsenko T.O. et al., 2015. Ministry of internal affairs of Ukraine: events, leaders, documents and materials (1917-2017). Vol. 4. Kyiv. P. 370. Memorandum about the state of criminality on Ukraine on May 17, 1936 [Dopovidna zapyska pro stan zlochynnosti na Ukraini]. In: Mykhailenko P.P. and Kondratev Ya.Yu., 1997. History of militia of Ukraine in documents and materials. Vol. 2. Kyiv: Heneza. Pp. 144-146. Grechenko, V. і Moskovets, V. (2018) Діяльність міліції щодо протидії злочинності в УСРР у середині 1930-х років, Право і безпека, 68(1), pp 17-24. doi: 10.32631/pb.2018.1.02.